Okay, I’ll give again to you a simple system with no indicator that I have ever used. Why always simple system ?…. because my brain was too heavy to think of complex systems … xixixi …. after all, a complex system does not always profit, is there a holy grail system? Hi-Lo trendline projection … maybe you’ve never heard it. Yup … SRDC Advance, where to draw the line trendline from “Yesterday High / Low” to “High / Low” candle at “0:00” (GMT +1), then will be able to predict the movement of high / low today. After my modification of this strategy, I found the entry points are fairly accurate, I’ve got hundreds of pips in one day using this system … but again I say that no system is perfect …. 1. Identify the “candle setup”. the candle “00:00” (GMT +1), this is my broker, please adjust your broker. 2. Draw a trendline from “Yesterday High”to “Candle Low Setup”. You can give a yellow color, this is the “Line Today Forecast Low”. Note the picture below …. 4. Observe the movement of prices, note and record the price reaction when it interaction with the yellow trendline that you have a picture. generally the price will bounce when moving around the trendline. 5. Mark when the price of trying to break the trendline, but failed to re-enter the area of ​​the trendline. 6. For Bullish scenario, if the price failed to break “yellow upper trendline”, then draw the trendline with a different color (magenta), from “Yesterday High”to “Yellow trendline” who have failed to break the price. Magenta trend line is the trendline support, you will execute buy at this trendline, if the price through this trendline, but turned again to the top. 7. For Bearish scenario, if the price failed to break “yellow lower trendline”, then draw the trendline with a different color (magenta), from “Yesterday Low”to “Yellow trendline” who have failed to break the price. 8. On the bullish scenario, you can exit buy position, when the price touches yellow upper trendline, as the upper limit price movement. 9. On the bearish scenario, you can exit sell positions, when the price touched the lower trendline yellow, as the lowest limit price movement. 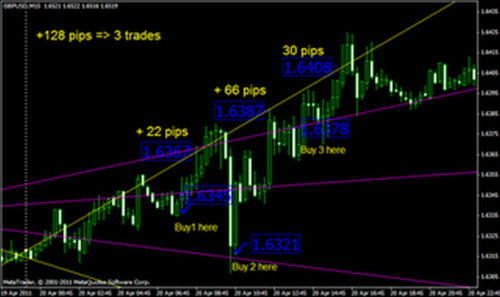 Need I remind you, the example above is the ideal … you can get hundreds of pips in one pair for one day using this technique. But not all ideal conditions …. I usually use the “EA’s profit lock” to keep the profits that have been collected.